The owners of 25 Kent Ave. want it to be Amazon's home base. WILLIAMSBURG — A slew of developers in North Brooklyn scrambled to cobble together a patchwork of properties in hopes that the cultural cachet of Williamsburg and its proximity to Manhattan would be enough to coax Amazon to build its newest headquarters there. The North Brooklyn pitch, pulled together by Jeremiah Kane of real estate investment firm Rubenstein Partners, is one of more than 24 put together by over 40 property owners, according to the city's Economic Development Corporation. The proposals for where Amazon could set up its 8-million-square-foot campus include 23 neighborhoods across all five boroughs covering more than 50 individual sites. Applications were due Monday and are now being reviewed by the EDC. 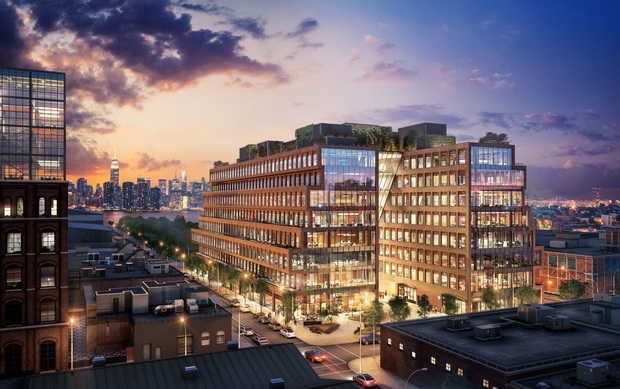 Kane — co-owner of the forthcoming 480,000-square-foot office and retail complex at 25 Kent Ave. — wrangled enough pieces of property in Greenpoint and Williamsburg to meet Amazon's needs of 8 million square feet, the company confirmed. “We believe the Williamsburg neighborhood offers Amazon the ultimate value proposition; it’s where brands from around the globe come to innovate and it’s where New York’s creative class lives and plays," he wrote in a statement. Rubenstein spokeswoman Lisa Serbaniewicz would not mention specific locations or developers involved in the pitch, though Jamie Wiseman of Cayuga Capital said he had put forth two of his company's properties at 10 Berry St. and 77 Wythe Ave. The process has required, "cooperation with a bunch of folks who are typically not used to cooperating; who are used to competing," Wiseman noted. While Williamsburg is competing with cities all over the country to lure the online retailer, it's already the kind of place Amazon employees would want to live, Wiseman continued, citing the area's vibrant combination of "office space, creatives, retail, nightlife [and] hospitality" in a "walkable, workable neighborhood." "The employees that Amazon wants to attract would enjoy living there," he said. In early September, Amazon issued a call for proposals for a new location for its second North American Headquarters, dubbed HQ2. "Some of the bids were sort of group efforts," said EDC spokesman Anthony Hogrebe, adding that his office received proposals from all five boroughs and that it was in the process of reviewing them. Hogrebe declined to comment on the specifics of how many proposals would be sent to Amazon, or on the developers and locations involved. Brooklyn Borough President Eric Adams and Bronx Borough President Ruben Diaz have called for the headquarters to come to their boroughs. In Queens, areas ripe for redevelopment projects, Sunnyside Yards and Willets Point, could have enough buildable space. While not many places in the city can woo Amazon with 33 consecutive acres, The Bronx can boast that ability. Simone Development Companies has offered up the South Campus at the Hutchinson Metro Center, featuring 33 acres of land already in the pipeline for redevelopment in Pelham Bay, according to Marlene Cintron, President of the Bronx Overall Economic Development Corporation. "We're in the game. We're in the game in a very serious way," she said. Cintron pointed out the campus's proximity to the Metro-North train stop, below-market-rate housing for sale and rent in the area, and plentiful space for new construction. "We're the only borough left that really, truly has great space," she said. 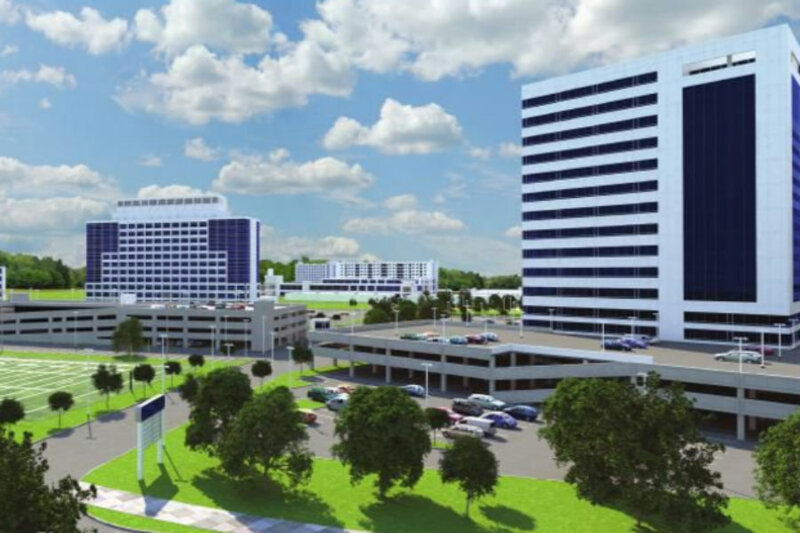 Simone Development Companies, which has already revamped the northern half of the 75-acre campus with a medical center, office space, a hotel and other amenities, confirmed its proposal. At its new headquarters, Amazon plans to hire around 50,000 high-paid employees over the next 10 to 15 years who will earn average annual salaries of more than $100,000. The company says it needs 500,000 square feet by 2019 and a total of 8 million by 2027, requiring its facilities be located in an area with more than 1 million people that's close to public transportation and an airport. The company is looking for tax breaks from state and local governments in its selection process, the company said. The competition is fierce, with cities across North America from Danbury, Connecticut, and Tulsa, Oklahoma, to Ottawa, Canada, lining up to lure the tech giant, the New York Times reported. Amazon spokesman Adam Sedo declined to comment on the selection process, pointing to the company's online request for ideas. Amazon already employs around 1,800 employees in New York City, Sedo said, and runs a photo studio at 35 Kent Ave. in Williamsburg and a distribution center in Sunset Park. Last week, the company announced plans to take on another 2,000 employees in the next three years as it opens a new distribution center on Staten Island and an office building in the Hudson Yards.